Space Theatre, Adelaide Festival Centre, Tue 9 Apr. Bold re-imaginings of well-known plays should always be supported and applauded and isthisyours? and State Theatre Company’s production of David Williamson’s The Club is no exception. A three woman cast taking on the iconic 1970’s play about football club shenanigans was always going to be an interesting idea. That it works so well is a credit to all involved. The original script is milked for laughs and a familiar story is given new life. From the moment Nadia Ross sets foot on stage as Ted the club president in ill-fitting suit, moustache and wig we know we are in for a fun ride. The exaggerated posturing of Ocker males, whose worth is based on physical achievements, is captured deliciously by this talented trio. The humour in the play comes not only from the male characters being lampooned by women, but also the fact that a cast of six characters is played by only three actors. This leads to some very slapstick moments, especially when there are meant to be more than three people in the room. The staging and costumes are inventive and contribute a great deal to the overall humour. Especially good are the wigs the actors use extensively to delineate the various characters on stage. The ‘bald-head-with-grey-comb-over’ wig is brilliant. The new popularity of woman’s football adds a further layer of interest. Whether this production was intended to coincide with the rise of women’s football or not, it still draws its biggest laughs from ridiculing toxic masculinity found in the male version of the sport. We can only hope that the politicking and manipulation in female clubs isn’t quite as ruthless as depicted in this play. Director Tessa Leong has chosen a very stylised and cartoonish sensibility which is built on the satire implicit in the script. The almost sing-song delivery of the lines by Louisa Mignone playing Gerry and Geoff, Nadia Ross as Ted and Jock, and Ellen Steele as Laurie and Danny is effective and at times quite hilarious. At other times the ham verges on being too thickly sliced! Apart from the hysterical opening scene of the second act, which cannot be unseen, this production keeps the 1970’s setting of the original play. But in the second act further complexities are added with the characters swapping from the original male to female characterisations. They even swap the characters they originally took. Despite this, the plot somehow stays on course. The relevance of Williamson’s comments about masculinity, sport and sexism remains pertinent in today’s context. The Club continues at Space Theatre, Adelaide Festival Centre, from 8pm until Mon 15 Apr. Space Theatre, Adelaide Festival Centre, Tue 9 Apr. Bold re-imaginings of well-known plays should always be supported and applauded and isthisyours? and State Theatre Company’s production of David Williamson’s The Club is no exception. A three woman cast taking on the iconic 1970’s play about football club shenanigans was always going to be an interesting idea. That it works so well is a credit to all involved. The original script is milked for laughs and a familiar story is given new life. From the moment Nadia Ross sets foot on stage as Ted the club president in ill-fitting suit, moustache and wig we know we are in for a fun ride. The exaggerated posturing of Ocker males, whose worth is based on physical achievements, is captured deliciously by this talented trio. The humour in the play comes not only from the male characters being lampooned by women, but also the fact that a cast of six characters is played by only three actors. This leads to some very slapstick moments, especially when there are meant to be more than three people in the room. The staging and costumes are inventive and contribute a great deal to the overall humour. Especially good are the wigs the actors use extensively to delineate the various characters on stage. The ‘bald-head-with-grey-comb-over’ wig is brilliant. The new popularity of woman’s football adds a further layer of interest. 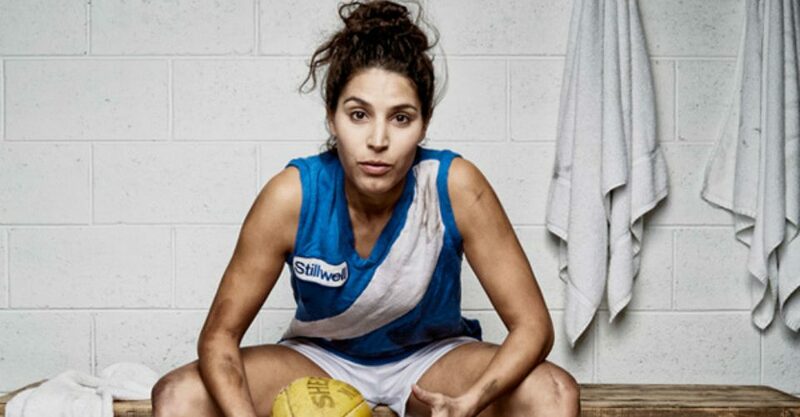 Whether this production was intended to coincide with the rise of women’s football or not, it still draws its biggest laughs from ridiculing toxic masculinity found in the male version of the sport. We can only hope that the politicking and manipulation in female clubs isn’t quite as ruthless as depicted in this play. Director Tessa Leong has chosen a very stylised and cartoonish sensibility which is built on the satire implicit in the script. The almost sing-song delivery of the lines by Louisa Mignone playing Gerry and Geoff, Nadia Ross as Ted and Jock, and Ellen Steele as Laurie and Danny is effective and at times quite hilarious. At other times the ham verges on being too thickly sliced! Apart from the hysterical opening scene of the second act, which cannot be unseen, this production keeps the 1970’s setting of the original play. But in the second act further complexities are added with the characters swapping from the original male to female characterisations. They even swap the characters they originally took. Despite this, the plot somehow stays on course. The relevance of Williamson’s comments about masculinity, sport and sexism remains pertinent in today’s context. Cathy Tune 4 stars The Club continues at Space Theatre, Adelaide Festival Centre, from 8pm until Mon 15 Apr. Book at BASS on 131 246 and bass.net.au. Click HERE to purchase your tickets. isthisyours? and State Theatre Companys kick a goal.